The Ringing Cedars - products and books. Vladimir Megre. Anastasia. As early as the 16th century, a cedar grove, a desyatina in size, grew in the lands of the Tolgsky monastery near Yaroslavl. Around fifty of the trees which grew there are still alive and bear nuts today, despite the fact that they are more than 400 years old. At present, cedar forests in Europe cover an aggregate area of several thousand hectares. There are many reasons to love and look after cedars. A cedar forest has a special microclimate, which ensures that it is always rich in berries, mushrooms, useful herbs and wildlife. Cedar nuts are a wonderful natural product. They contain a lot of fat, proteins, carbohydrates, micro elements and vitamins. They can also be used to make cedar oil, which could compete with olive oil. Needles were used as a remedy many thousand years BC. Sumerian clay tablets, found during archaeological excavations of the ancient kingdom of Sumer, confirm that needle extracts and decoctions were used in compresses and stupes as early as 5,000 BC. In ancient Babylon, aromatic oils were added to construction materials used to build temples. The well-known antimicrobial properties of cedar oil ensured that temples were disinfected. The people of Siberia praise the cedar as the bread tree. They look after cedar forests near their settlements and turn them into forest orchards. They say that in ancient times, a desyatina of cedar forest was equal in value to a cow. The large-scale industrial use of the taiga, which began this century, was an extremely unfortunate development for the cedar. This is, primarily, because the cedar is extremely good for logging. Cedar trunks produce a large volume of timber and are easy to process. Nothing comes close to them in the taiga. Some cedars can produce up to ten cubic meters of timber. And no ordinary timber at that! It's soft, pleasantly colored, easy to work and convenient for any purpose. You can make anything out of a cedar trunk: a house frame, a door and doorframe, furniture or house wares. You can put any clothes in a cedar chest or wardrobe without worry. Moths won't get to them because the aromatic, tarry smell will repel them. Cedar planks are the most sought-after raw material for pencil factories. Cedar wood has excellent resonance qualities and is used to make grand pianos, harps and guitars. 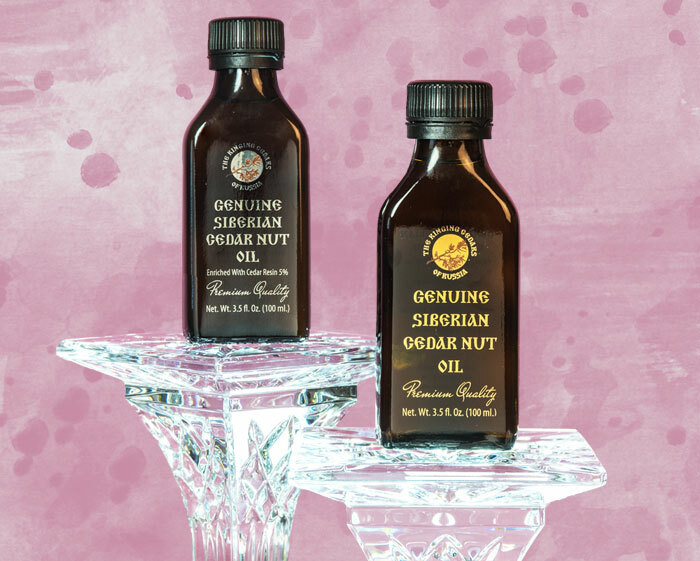 They say that during the last century Siberian merchants were offered what appeared to be a very profitable deal by Germans for the supply of Cedar Nut Oil. The only stipulation was that it was packaged into cedar barrels. It turned out that there was a catch. The Cedar Nut Oil containers were sold on to a musical instrument manufactory and the foreign traders made twice as much for them as they paid for the Cedar Nut Oil. In addition, good cedars grow along rivers, which makes them very easy to log. You cut down a tree and send it downstream - it will get to the destination by itself. Needless to say, this didn't end well for the cedar, the rivers, or the birds and animals it protected. Foresters have long since understood that you cannot treat cedar forests with the loggers' usual attitude. The earth and everything it produces is important in a cedar forest. The overall products of a living cedar forest are far more valuable that its wonderful and extremely valuable wood, produced by cutting down the whole forest. "Contact between the oil and metal initiates the transformation of unsaturated fatty acids into saturated ones, which significantly reduces the oil's antioxidational properties. The natural information is also neutralized." There are many options for administering the oil when treating various diseases. The most effective and common method of consuming Cedar oil for preventive purposes is 1 tea spoon 30-60 minutes before a meal 2-3 times a day for 40-60 days. Consume very slowly, as if diluting the oil with saliva. Treatment involving cedar oil was administered to people suffering from gastritis, erosive and ulcer diseases of the stomach and duodenum, people who were operated on as a result of stomach cancer, people suffering from astenization, psychosis, and increased excitability of the sympathetic nervous system (increased fatigue, inability to work or sleep, common nervous breakdowns, and regular headaches). Treatment was effective in all cases to varying degrees.